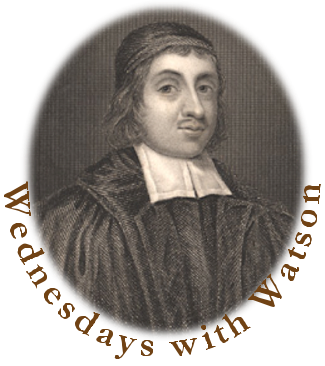 Wednesdays with Watson is a weekly reading taken from my favorite Puritan writer, Thomas Watson. This week’s selection is from The Christian on the Mount. Enter into a serious meditation on the state of your souls; while you are meditating on other things, do not forget yourselves; the great work lies at home. It was Solomon’s advice, “know the state of thy flock” (Proverbs 27:23). Much more know the state of your soul; for lack of this meditation, men are like travelers, skilled in other countries, but ignorant of their own. So they know other things, but not how it goes with their souls, whether they are in a good state or bad. There are few who by holy meditation enter within themselves. Self-guiltiness. Men are reluctant to look into their hearts by meditation lest they should-find that which would trouble them. The cup is in their sack. Most are herein like tradesmen who, being ready to sink in their estates, are reluctant to look into their account books lest they should find their estate low. But would it not be better to enter into your heart by meditation than that God should in a sad manner enter into judgment with you? 1. About your debts. See if your debts are paid or not, that is, your sins pardoned; see if there are no arrears, no sin in your soul that are unrepented of. 2. Meditate about your will. See if your will is made yet. Have you resigned up all the interest in yourself? Have you given up your love to God? Have you given up your will? This is to make your will. Meditate about your will; make your spiritual will in the time of health. If you put off the making of your will until death, it may be invalid; perhaps God will not accept your soul then. 3. Meditate about your evidences. These evidences are the graces of the Spirit; see whether you have any evidences. What desires have you after Christ? What faith? See whether there are any flaws in your evidences. Are your desires true? Do you as well desire heavenly principles as heavenly privileges? Oh, meditate seriously upon your evidences.